It wasn’t until law school that someone told me to my face that my name, Takeia, was considered “ghetto.” Until that point, all I knew was my name and that I required people to pronounce it correctly if they were going to talk to me. Five-year-old Takeia held lessons in classrooms and on playgrounds on how to pronounce my name: Ta-kee-uh. When I was younger, I don’t think I knew why I demanded that recognition, but now I know: your name is often the first glimpse into your identity that people have. As the poet says in the video, I demanded that people pronounce my name correctly or not say it at all. In law school, when professors would call on me, they would say my first name. They almost always got it wrong the first time. I corrected them, and would not allow them to move on to whatever question they had until they got my name right. Yes, I had the audacity to require recognition before I proceeded in any relationship with you, even if that relationship was for three fleeting minutes in which I presented the facts, issue(s), holding and reasoning of a case. For those that persisted in incorrectly pronouncing my name, I let them know they have the option of calling me Ms. Johnson instead. We live in a world in which the politics of identity means that there are social forces always working to ignore, deny, and denigrate individuals and groups based solely on their identities – whether it is based on race/ethnicity, gender identity, sexual orientation, or any number of other identifiers. 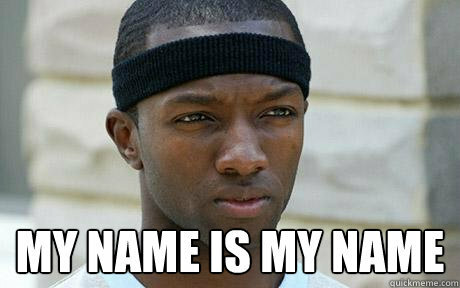 Marlo Stanfield said it so succinctly on The Wire: my name is my name. It is the world’s first entry into my identity and I demand recognition. This is such a great article and I think that this is an issue people often do not consider. Having an “ethnic” or “ghetto” name myself, early in my career, I often replaced my first name with just an initial, or a shortened version of it. However, after time passed and confidence set in, I realized I am who I am, and my name is my name. More importantly my name is unique. Like you, I require it to be pronounced correctly and will not allow it to be shortened. Great insight, TJ! Thanks for stopping by and sharing your experience, Vy! Sharing our experiences helps to situate the conversation so that people may not only find community, but also advice on how to navigate our professional lives. I have been grateful that my name does not give away my racial identity. I often notice the shock and hesitancy in the face of people who have read my credentials and then scheduled a meeting with me in person. I have often wondered if they would have requested to meet/interview me if they knew what I looked like beforehand. It really is a shame that people of color have to consider how our names will negatively impact our chances at professional success. I’m glad the issue is being researched and discussed, but I wish it didn’t have to be. Best of luck on your success journey, SP!